Golden Apples: Not Knitting. but Fiber related--in the end! Not Knitting. but Fiber related--in the end! Going to Pot.. wtih a bunch of Enablers. For years, I didn't have much interest in photography. I wasn't very good, and wasn't interested in spending all the money needed to get good. I've owned (still own) a PHD camera (Push Here Dummy) that had an auto focus and used 35mm film. But I found, I needed to take dozens of pictures to get one I liked, --and the feed back loop, (take picture, develop, evaluate, retake picture) was way to too long. Digital has helped change that. Ten images memory, and the memory card was sealed inside the camera. My next digital camera was a Kodak Easy Share, purchased about 4 years ago. 3.1mega pixels, 3 optical, +4 digital zoom setting –it even took Video. It wasn't the smallest camera I've ever owned –but it was much smaller than my 35 mm PHD camera. And it came with a 64MB card..WOW!-(you have to understand, my first computer, (which was my computer for the next 7 years!) came with NO hard drive, and when I upgraded year 2 or so, I got a 48K (yes, 48 K!) memory module, and my first hard drive (some time later) was a DD/DD floppy drive (128K? Or was it all of 256K?) --and these upgrades cost hundreds of dollars! I've been digital a long time(since 1983) and well I remember when a 40MB drive was consider BIG (and it had a big price too--$400!) --and here I was with $25 memory cards that had more memory, for way less money! Over time, I upgraded-- first to a 250MB card, then to a 1gig one, , and now up to a 2gig card (which, cost about the same as my first 64MB card!) --a nice selection of memory cards (and I've also upgraded to a cel phone with a camera—and it conveniently uses the same size memory cards!) I got a tripod too! Then, last month, I've upgraded to a newer digital camera. It's smaller, and lighter (it's another Kodak Easy Share)--this one has 7.0 mega pixels. It's easier to use, and it came with upgraded software that allow simple (and let me be honest, simple is all I want) software for editing the video. Didn't I start this post saying it was about fiber (Not about photo's?) Well the new camera needed a case. The clearance center at one of the craft stores came to the rescue. 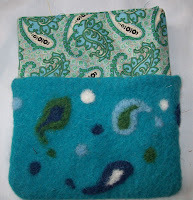 A pre-made felted pouch. The zipper was broken, the lining ripped.. But the size (and the price!) was right! So a new lining was in order (and a new zipper) and I needle felted some decoration (I used the lining fabric as inspiration) and then I wanted more.. so out came the embroidery floss, and one thing lead to another...The result? It's great, your little camera bag. 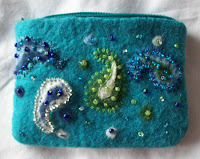 It looks just like a small cosmetic purse, and the colors are delicious. I still love the my old Fujika 35 mm, for close ups, micro shots, and all the getting great shots of birds, but, agreed, when you don't have access to a dark room, you have to take a class or the film processing eats you up. Helen...? Yooo-hoooo! Hello? Are you there? I miss you! And no offense, but this post is getting a little old now.